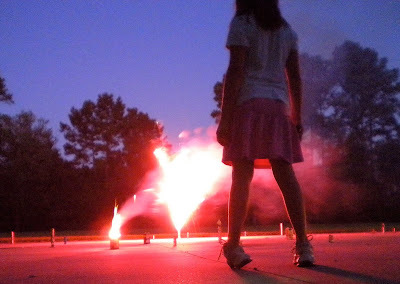 My family has had a love/hate relationship with fireworks ever since our children came along. I love fireworks, love to watch them and ooh and aah. My children, on the other hand, have abhorred fireworks for a long time. When we go to Disney World we still find places outside of the park to watch the fireworks so the kids won't complain. I keep waiting for them to get old enough to appreciate them. Part of the problem comes with the "fire" part of the equation. They have not been "play with fire" kind of kids. We have a fireplace and have fires all winter and neither of my children will light the fire. They don't even like to light birthday candles!! Last year my son got braver and started lighting some of the small fireworks that we buy for the Fourth. This year my daughter asked if she could light some of the fireworks. I think we're over the fireworks aversion! I hope you all had a great weekend. Thanks to all who have served or are serving our great nation to protect our freedom! My kids like them, but they go to bed before it gets dark so they've never really seen them up close.